The regular followers will know that I am actively involved on the Golf Monthly Forum and over the past couple of seasons they have run a national competition for the forum members with regional qualifiers before a grand final. This year the final is being staged, as it was last year, at Hillside Golf Club in Southport. 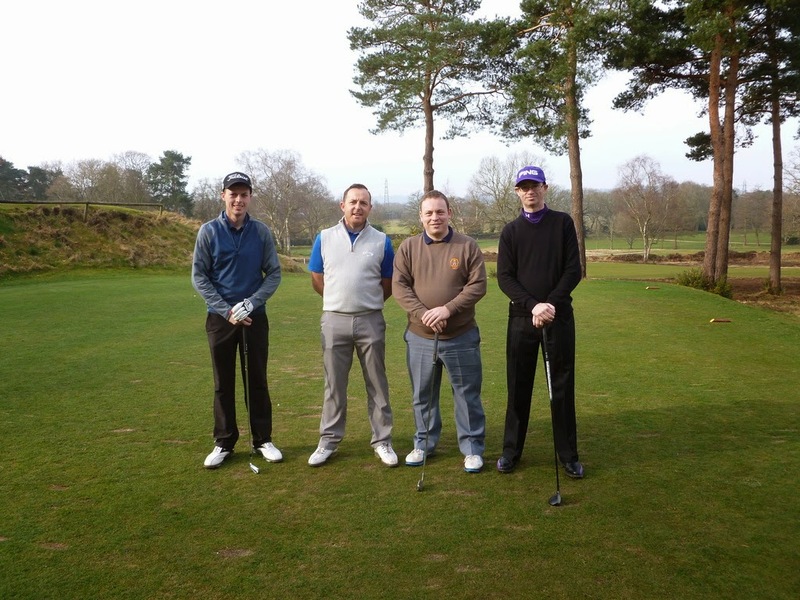 The day was bright and sunny and Spring was definitely in the air as forty three golfers nervously congregated to play. The first hole is a gentle par four playing uphill. However there's a ditch that crosses the fairway that needs to be treated with respect. I took a hybrid off the tee to lay up short and found the fairway. From there it was a simple nine iron into the green. So far so good. 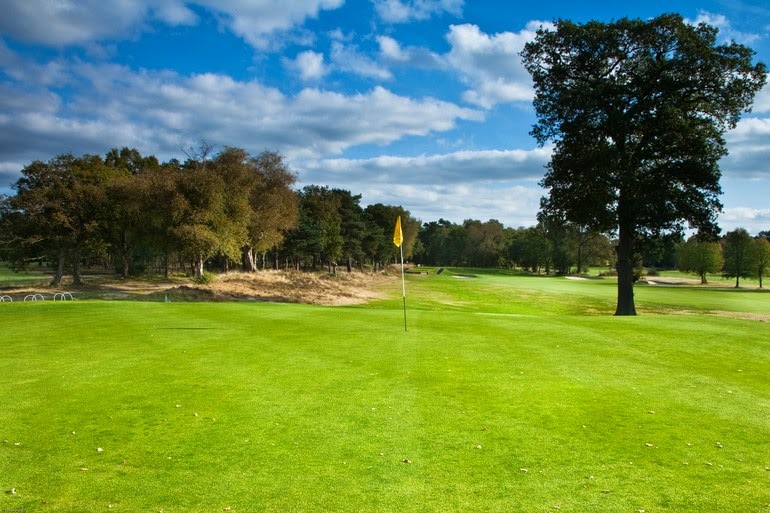 However the Blackmoor greens have a fearsome reputation and I three putted, downhill, from twenty feet for an opening bogey. I started a little nervously. I was hitting the ball nicely but not quite converting early chances. The fourth hole is stroke index one. It usually plays into a prevailing left to right wind and with heather guarding both sides, an accurate drive is needed to leave a mid or long iron into a green protected on the right by water and left by a deep bunker. There is also out of bounds left to really get your attention. I hit a reasonable drive right into the semi-rough but with a good lie. With 189 yards left I hit a lovely four iron, fading nicely into the heart of the green before running up to within five feet. I managed to coax the putt in for a gross birdie and my round was really off and running. My driving has never been a strong facet of my game but I was driving the ball rather well on the front nine and it was ensuring I was able to make strong progress. The seventh hole, stroke index three is another long par four measuring nearly four hundred yards. There is a bunker to the left of the fairway which needs to be avoided to leave a longish second shot into a two tiered green. I found another fairway and hit an exquisite hybrid into the green finishing no more than eight feet away. I managed to gander another gross birdie. It was beyond my wildest dreams. I three putted the next, a par five, from thirty feet after a mediocre approach but found the heart of the green at the ninth. It's only a short hole, playing uphill as many of the par three's Colt designed do. I was faced with a slippery downhill putt that screamed caution and I got it down to two feet but only just made the par putt. However it dropped and it concluded an opening nine holes of 38 shots (+3 gross) and twenty one points. I made a fine par at the next and then came to the shortest hole on the course. Played over banks of heather there are bunkers left and right to catch an errant shot. I caught my tee shot way too clean and it rocketed through the green and down a steep bank. With the putting surface running front to back I couldn't get too aggressive so opted to get the ball on the green, take the resultant bogey and move on. Not ideal but not a disaster and a pragmatic approach. I made a bit of a mess of the following two holes. I played the par five poorly, missing the green left into sand for a nasty bogey. Fortunately it was a shot hole and a net par but with only a short iron in I had a great chance to make my par and really keep the momentum going. The fourteenth is an innocuous par four. Miss the pond to the right at the 230 yard mark and it is a chance to make a par and maybe a birdie. I did the first bit and hit a lovely drive to leave an eight iron in. I hit it fat and again it was a poor shot. It yielded a bogey from nowhere and this time there was no shot on the hole to save the day. Part of the New Golf Thinking mantra is not spiralling down and letting a bad shot or bad hole lead to another and one poor hole suddenly becoming a run of two or three. 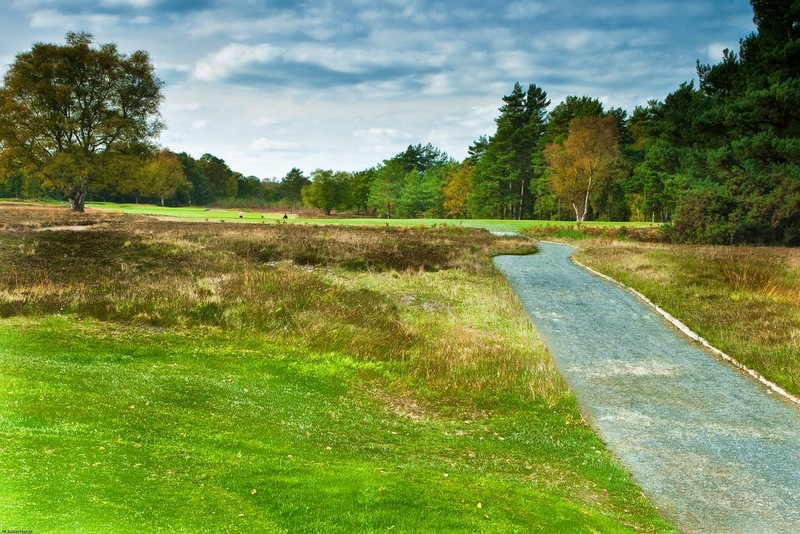 The fifteenth, according to the Blackmoor website, is one of the hardest par three's in Hampshire. I'm not entirely convinced I'd agree. It was playing around 185 yards to a green shaped like an upturned saucer with plenty of bunkers guarding the putting surface. I found the green with a five wood. It ran to the back of the green and I left myself with a nervy three footer for my par. It dropped. A fine time to get a par, net birdie. The sixteenth is another par four that is protected by heather left and right off the tee. The green turns a little to the right and having missed the fairway right, I was faced with a choice. I had a tree in my way. Could I go aerial and make the green or would I have to go low. I decided I was too close to miss the tree and tried to play a very long pitch and run with a four iron from around 120 yards. I wanted to play it to the left to give myself the widest landing area but I made a bit of a hash of the shot and missed the green on the short side and right. My chip and run wasn't convincing but I fluked it to six feet and made another par putt. It was a streaky par but as the old adage goes, there are no pictures on a scorecard. The penultimate hole is another uphill par three. Again it isn't long, playing around 150 yards to a green protected by deep bunkers all around. I didn't execute and missed short and right leaving a touch pitch over a bunker from a tight heathland lie. It wasn't a time to get cute and fancy and I played a conservative shot to twelve feet. I never really threatened the par putt and it was another single point hole. 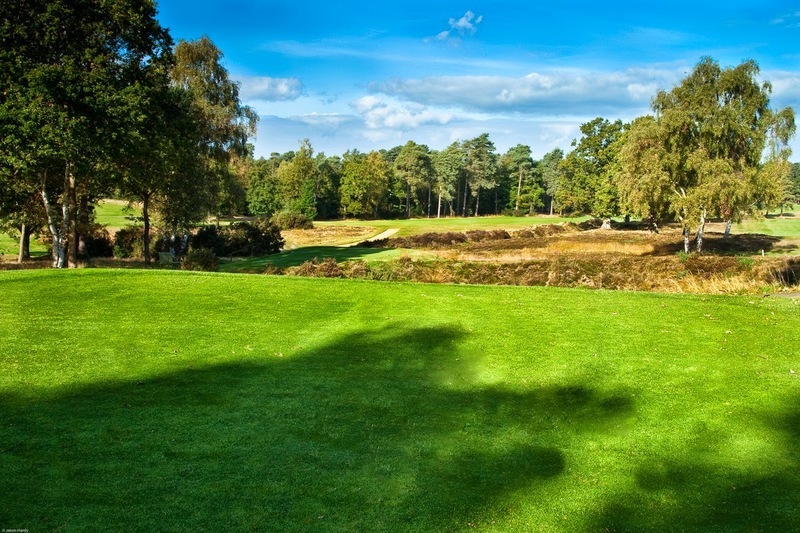 The last is Blackmoor's signature hole. Another par four just shy of four hundred yards, and a good drive still leaves an uphill shot. With out of bounds left in front of the clubhouse and a deep pit to the right of the green, the approach has to be deadly accurate. I hit my worse tee shot of the day, a quick swing leading to a low hook into the heather. I was lucky to get a good lie and I advanced it to within seventy five yards of the green on the fairway. The green has a fearsome reputation and is long and heavily contoured. With the flag at the back, the correct shot should have been a low running shot. Instead I hit a high pitch. It landed on the front third and the contours took the ball back to the front edge. It was no surprise my round ended as it has begun with a three putt. I'd come back in 41 shots (+7 gross) and seventeen points for a grand total of 38. I had broken 80 (79 or +10 gross). To be honest I thought with so many players that would be at least a point shy. Indeed it was and there was a score of thirty eight in. However as the player concerned wasn't entered into the Race to Hillside, he was ineligible to qualify. That meant my score was good enough for second place overall and the Southern Area qualifier for a second year running. Lightening had struck twice. Granted I wasn't the winner on the day and perhaps fortunate to have qualified but in my own mind at least, I had played really well and so perhaps deserved my touch of good fortune. Either way, I'm off to the grand final at Hillside in May. Without doubt I was very happy with my performance. Over 60% fairways in regulation and a healthy 39% greens in regulation were the building blocks to the good score. A respectable 35 putts, despite several three putt greens on large and undulating putting surfaces was pleasing. However, and you knew there would be a however, I was very unhappy with my iron play on the back nine. I hit a number of heavy approaches, missing the green with not much club in hand. I hit a poor tee shot at the seventeenth and was way short and right. In general the iron play on the second nine lacked any sparkle. If I was being honest, I think I became acutely aware of how my round was progressing and the fact I was likely to be in contention. I think I got ahead of myself thinking what hitting the green on particular holes would do to the scorecard. On the front nine I was playing with more freedom and just swinging and executing. On the back nine, I almost became to conservative and tried to be too careful. Off the tee I was still swinging without shackles to try and hit the fairway to set up the chances. Despite that, it was a fantastic performance and I am more than happy, not only to be the Southern Area qualifier for the second year running, but to see how the work I have put in over the winter is beginning to play off. In recent rounds, I have started to play nicely. There have still been a few poor shots and disaster holes to take the gloss off a good round but it is still very early in the season and so there is much to be encouraged about. I'd like to thank Blackmoor Golf Club for their impressive hospitality and for getting the course looking so good so early in the season. Without doubt in a few weeks time, when the greens are running quicker and the heather grows a little more it will be a brute of a course. Beautiful but dangerous. I'd like to thank all of the Golf Monthly Forum members who played for making it a great day and it was good to catch up with old faces and meet some for the first time. Finally a big thanks to Richard Hart, Blackmoor member, for his hard work organising the day. I knew I'd been playing well and that the game is beginning to come but I really had no ambitions about qualifying. I wanted to play as well as I could and see what happened but the outcome surprised me. My game is coming and in reasonable shape. Bad shots aren't necessarily round busters and the good ones are now very good. There is still much work to be done on the short game (I've spoken about this before) and it's an area I'll be working on once the clocks change. For now, I'm planning my trip to Hillside and I guess I better learn some links skills like the long bump and run, low drives and the Tiger Woods stinger. In the meantime, if you fancy seeing what's going on on the Golf Monthly Forum have a look here http://forums.golf-monthly.co.uk/index.php and feel free to join in the fun and games. Who knows, maybe next time I could be playing with you. If that doesn't put you off, there are always games being arranged around the UK and Ireland and Golf Monthly provide a lot of money can't buy opportunities specifically for forum members. I'm hopeful this form will continue and I'll carry on working hard on my game. I've a feeling I am going to give my ambition of single figures in 2015 a really good run for my money and we'll see how close I can really get.